View More In Monitors - Page 3. 2. "VOL-": Select this key to adjust volume "down"
3. "VOL+": Select this key to adjust volume "up"
Note: The DC 12V wall adapter is included. And there is no headphone jack. PONPY After Service: 30 Days Money Back Guarantee, 12 Months Warranty! 【Mini & Portable】Super slim design with 1/3 inch thickness, screen aspect ratio is 16:9. This 7" LCD monitor is designed tiny and light, you can even carry it in your handbag. Warm tips: The headphone jack is still in testing phase which can not be used temporarily. 【Visual Enjoyment】The super 7 inch TFT LCD monitor display screen with HD 800*480 high resolution delivers excellent detail, work stable and anti-jamming, bright saturation image and high color reduction give you a pleasant visual enjoyment. 【Personalized Features】Item size: 7.01"(length)x4.64"(width)x0.33"(thickness), package weight: 1.25lbs. Built-in 1.5W high fidelity speaker, with high sensitivity touch buttons operation and full-function remote control, make it more convenient to operate via multi-language menu. 【Extensive Use】With rich input ports include 2 way video input(AV/RCA), 1 way audio input, 1 way HDMI&VGA input, it can be perfect used as CCTV security monitor, PC monitor, Raspberry PI monitor ,DSLR monitor and so on. Warm tips: this LCD color monitor will not support automatic switch rear display function since it is specially designed as household products. 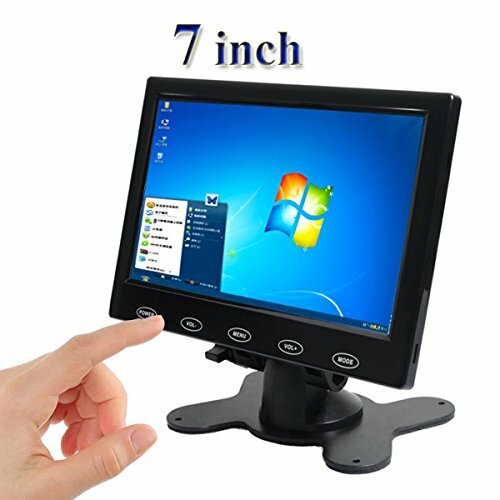 【Package List & Return Policy】Package Included: 1 X 7" LCD color monitor; 1 X Power supply for monitor; 1 X Mount stand; 1 X AV cable; 1 X VGA cable; 1 X Remote Control; 1 X User Manual. Quality Guarantee to Cover Any Issues: Follow amazon 30 days return policy and 12 months replacement warranty. If you have any questions about this product by PONPY, contact us by completing and submitting the form below. If you are looking for a specif part number, please include it with your message.